And now for images summarizing recent information on EB-5 petition processing times (from the USCIS Processing Time Information page, updated 8/7 for IPO), I-526 and I-829 petition volume (from the USCIS Immigration and Citizenship Data page, updated 8/19), and I-924 processing volume (my unofficial tally). 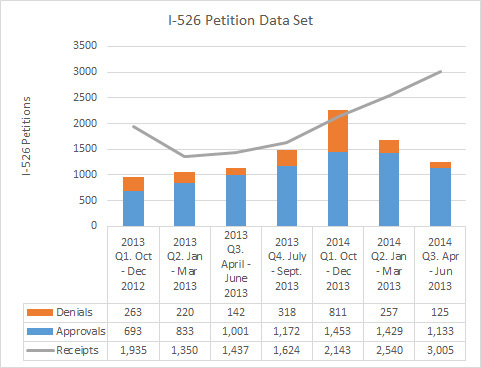 The numbers show that EB-5 petition receipts still exceed the number of petitions processed every quarter, with that gap increasing for I-526 and holding steady for I-829. Denial rates were unusually low last quarter. 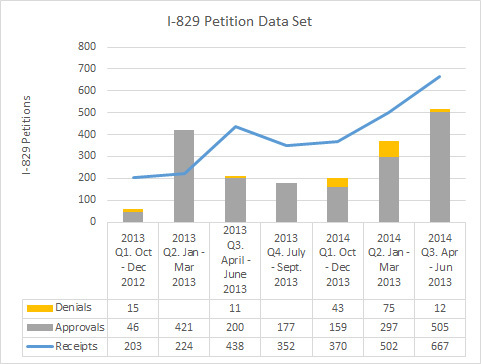 Overall processing volume improved significantly for I-829 and fell again for I-526. Perhaps fortunately, since the 7,688 I-526 petitions received already in FY2014 would put us well over the annual EB-5 visa allocation if adjudicated in a timely manner. 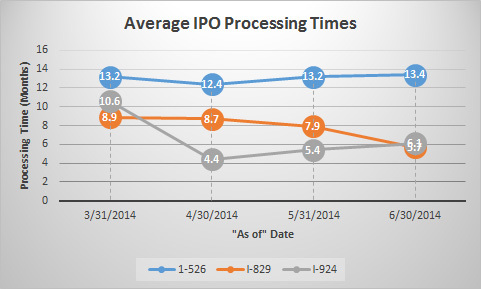 Average processing times have not shown dramatic change over the past few months (except for when USCIS took I-924a out of the I-924 average between March and April). 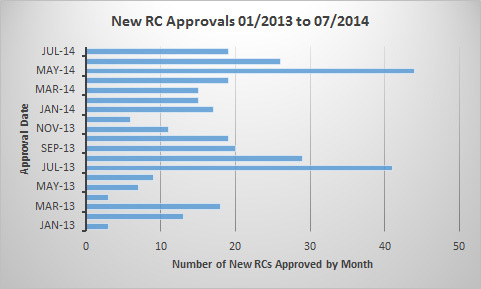 Meanwhile, the roster of approved Regional Centers continues to expand rapidly. Click on any image to view the full size version. And note my other new posts from today on business plans and the newly-announced 9/10 stakeholder meeting.